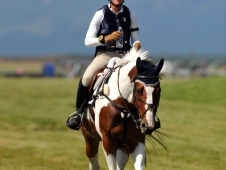 It’s been three months since Revitavet Capato proved himself a four-star horse at the Rolex Kentucky CCI****, but that doesn’t mean his rider Jordan Linstedt will be resting easy tonight. 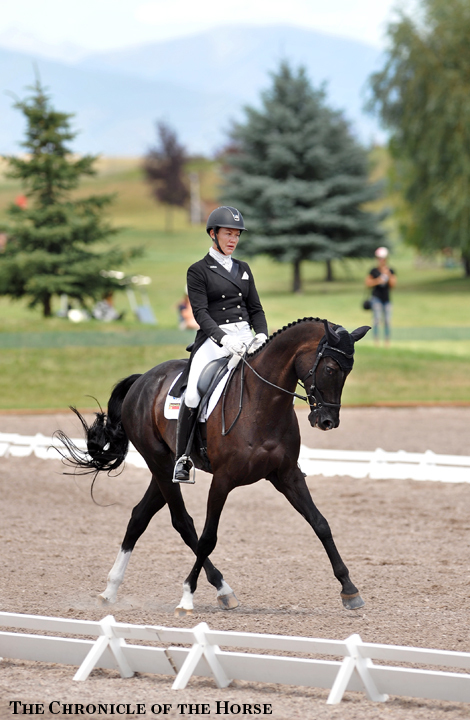 Her status as the dressage leader (43.7) in the inaugural CCI*** division at The Event at Rebecca Farm gives her only the slightest breathing room over second-placed Buck Davidson with The Apprentice (44.1). 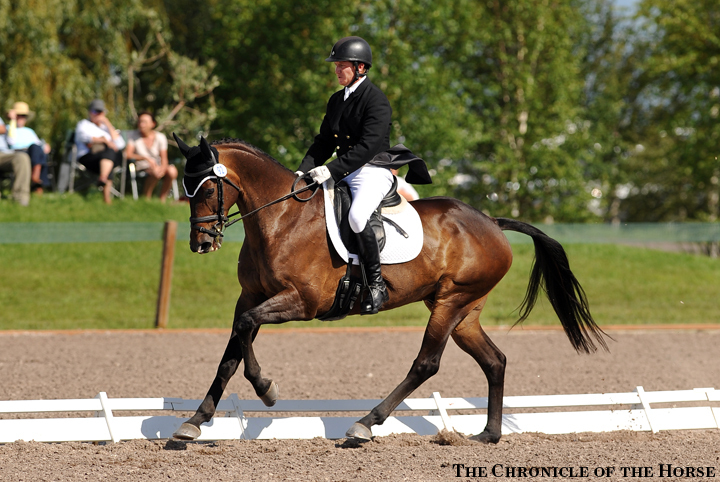 “Capato” completed his first four-star, ending up 35th place with one stop on cross-country, but Linstedt, of Redmond, Wash., said it was battle every step of the way. 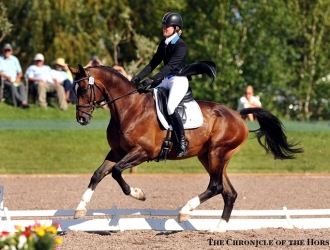 In the dressage, Capato has been going better and better as the season’s progressed. 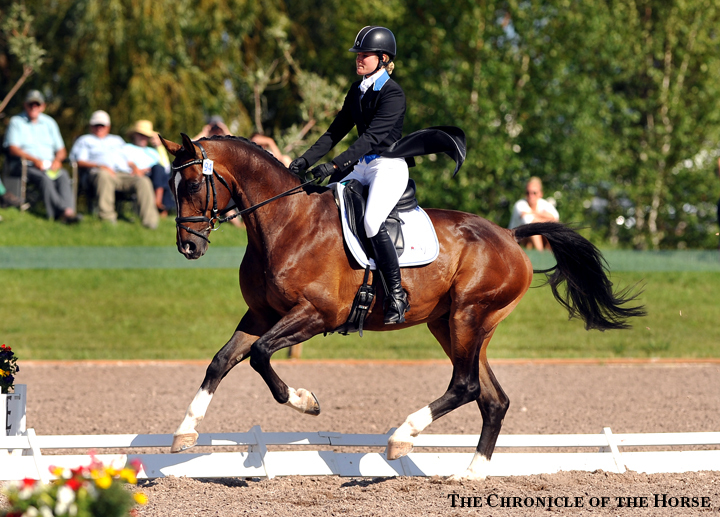 While their test wasn’t flawless in an arena surrounded on all sides by spectators and flapping flags and tents, the flashy 12-year-old Hanoverian gelding scored well for his elegant, elastic gaits. 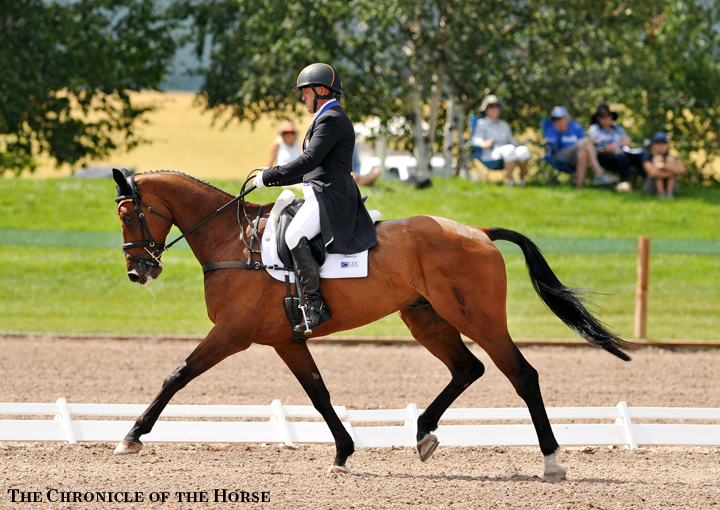 Davidson, of Riegelsville, Pa., and Ocala, Fla., was pleased with The Apprentice’s performance, but he said his second mount, former Galway Downs CCI*** winner Petite Flower (standing seventh on 54.7 penalties) isn’t feeling herself this weekend. 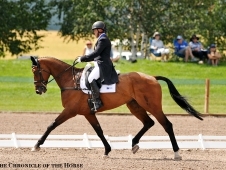 “The Apprentice did for sure his best test, which I was quite happy about,” Davidson said. “One judge [see below] didn’t seem to like him as much as the other two, which was a bit of a bummer, but he was very good. Linstedt, Davidson and third-placed Kurt Martin all agreed that tomorrow’s course, designed by Ian Stark, is a bit longer (10:41) and bigger than they expected. 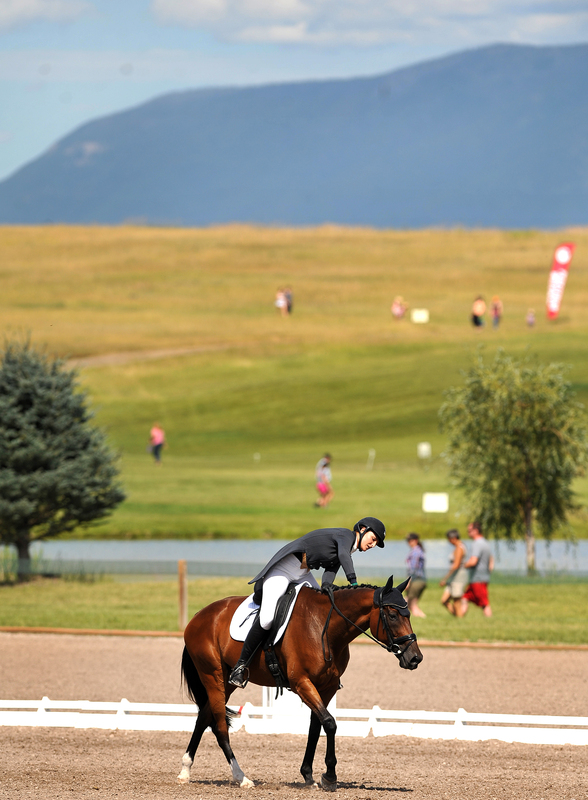 “The gallop fences are almost a little bit too small to help hold the horse,” Davidson said, “but then the combinations are quite big and substantial. They’re all right up to maximum size. And it walks long. It’ll be a unique test. 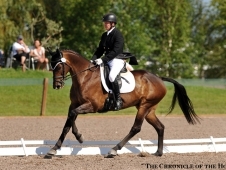 “It’ll be a fitness test, and I don’t think it’ll be a dressage competition,” he warned Linstedt jokingly. 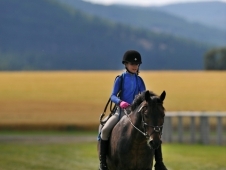 This year’s starter tally—587—is a new record for Rebecca Farm. 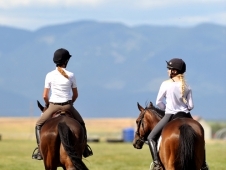 The cross-country order of go has been altered from its original schedule, which had CCI*** horses running first thing in the morning to avoid the heat. 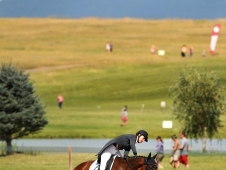 Concerns about low lighting on some of the fences, however, prompted the organizers to move the two-star division up. 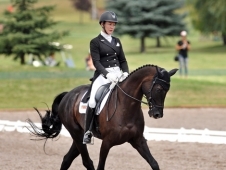 Those riders will head out of the start box starting bright and early at 8 a.m.
Several three-star riders felt the wrath of the judge at M, Heather Buckland of Australia. She marked CIC*** leader Tami Smith 8 and 11 percentage points lower than the other two judges, and in the CCI*** she scored second-placed Buck Davidson and The Apprentice 6 percentage points lower. 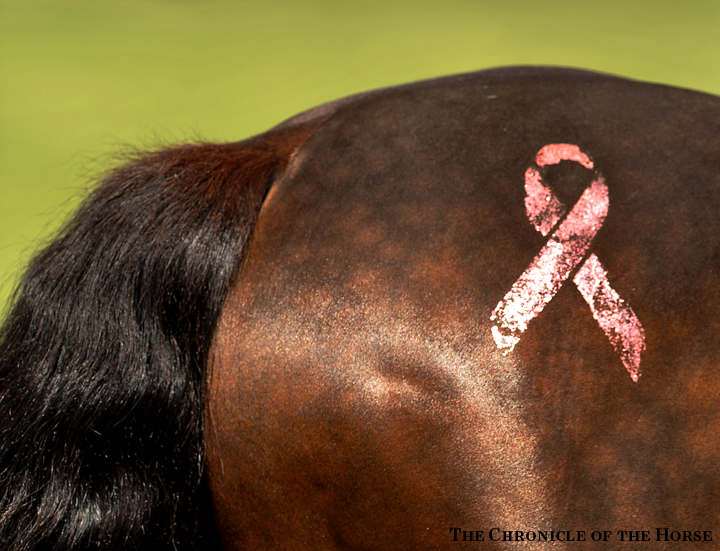 The Event at Rebecca Farm offers multiple opportunities to support breast cancer research through its “Halt Cancer At X” initiative, which honors the farm’s namesake, Rebecca Broussard, who passed away in December of 2010 after battling breast cancer for more than a decade. Profits from the event’s lemonade stand and $5 parking suggested donations go toward research funding, and riders also had the opportunity so solicit pledges for the performances at the event. In addition, a small donation can get you a glittered pink ribbon quartermark applied to your horse. 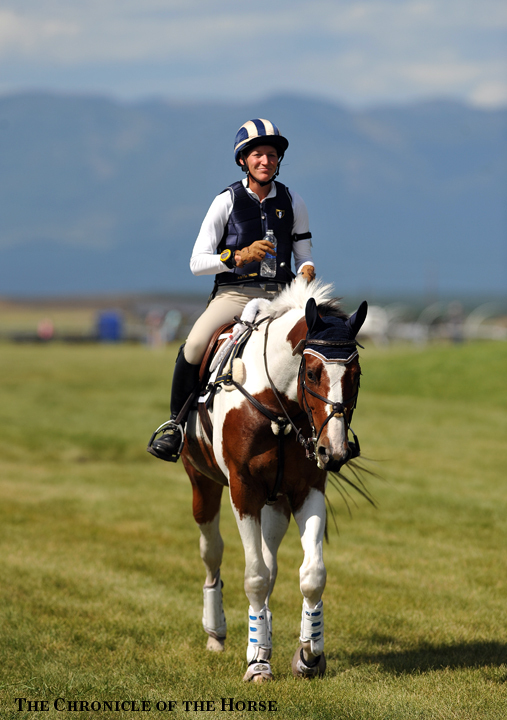 Then there’s the inaugural “Sh*t Show” division, in which organizer Sarah Broussard, course designer Ian Stark and course builder Bert Wood are competing in their own three-day event on “very recently retrained” off-the-track Thoroughbreds. 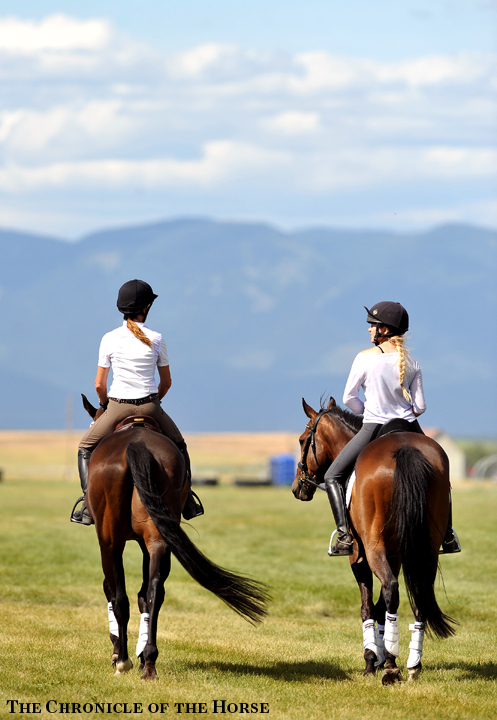 The catch is that spectators can pay for specific bonuses or penalties for the rider of their choice (i.e., a $50 donation gets your rider one mark of 10 on a dressage movement, or for $100 you can punish someone with a dangerous riding penalty). The inaugural winner of this special division will get to take home a jar of marbles (the assumption being that all three riders have lost theirs). 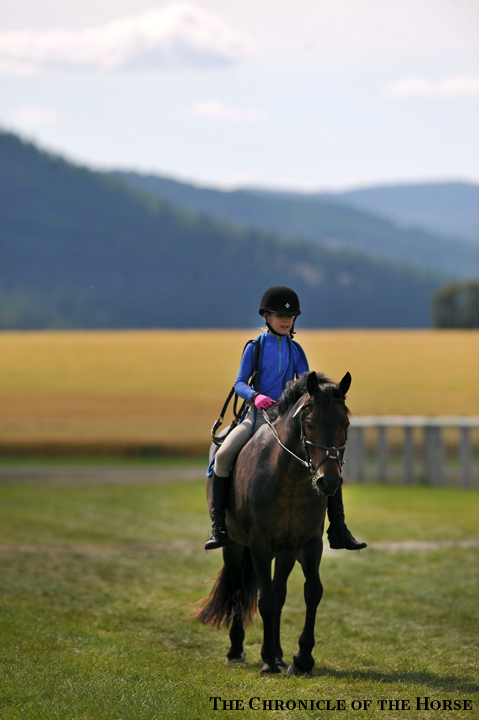 Visit Rebecca Farm’s website for more information about the event or to donate to Halt Cancer At X, or click here to view provisional results for all divisions.